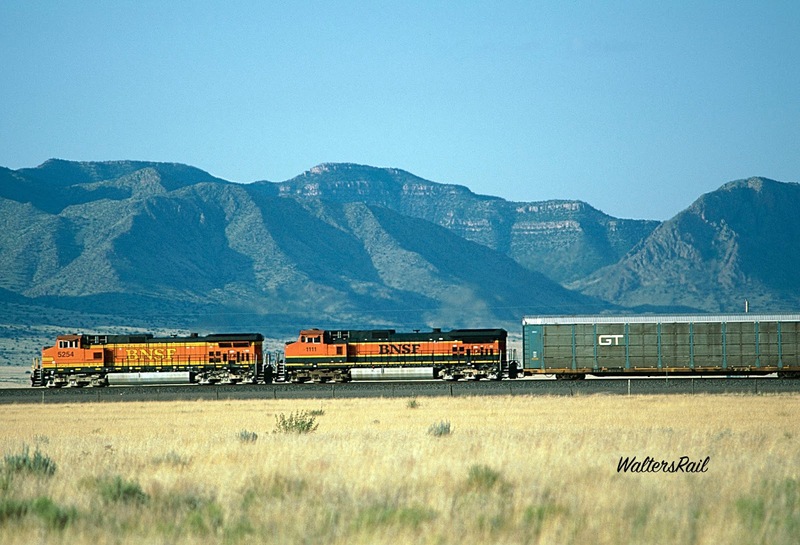 This image shows a Z train climbing an eastbound grade and approaching New Mexico State Highway 47, one of my favorite locations for photographing trains. 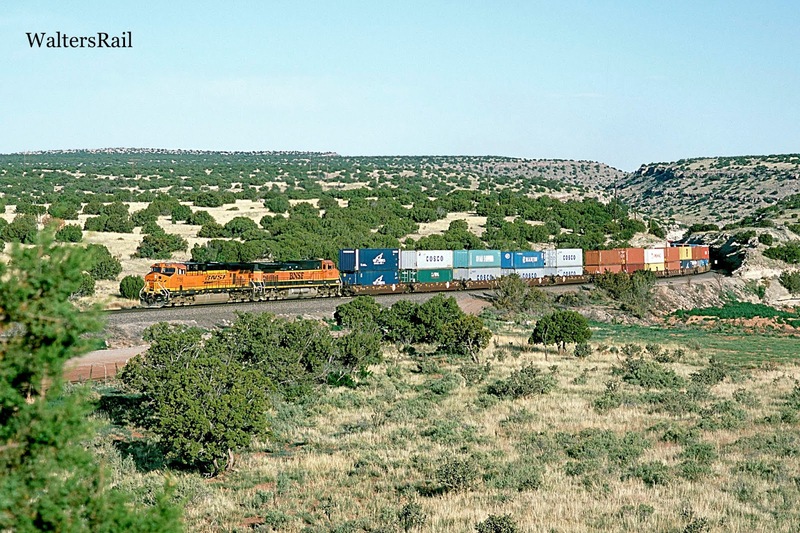 The camera is looking down the wide valley of the Rio Grande River, unbroken by significant bush or tree or even tall grass, toward Belen, New Mexico, site of BNSF’s railroad yard, a few modest hotels and a couple of places with decent food and cold beer. It is a mild day on December 21, 2008, the shortest of the year, and the sun is setting about 30° south of due west. I have been both hearing and watching the Z train’s approach for many miles––first a pinprick of the light below dark mountains, then soft rushing, barely audible above the wind through the shortgrass. The light grows larger, then larger still. The sound grows louder, then even louder. 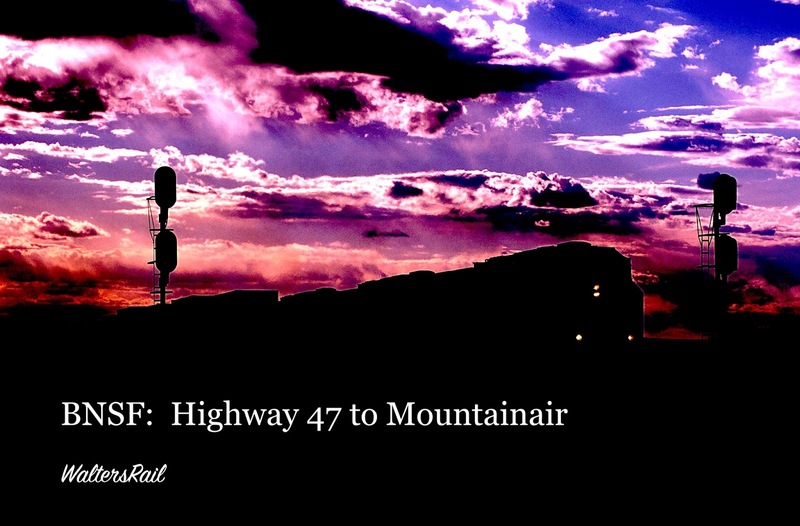 Occasionally, a car roars past on highway 47, barely slowing at the railroad crossing. Meanwhile, trains behind me continue to roar down the mountainside from Abo Canyon. 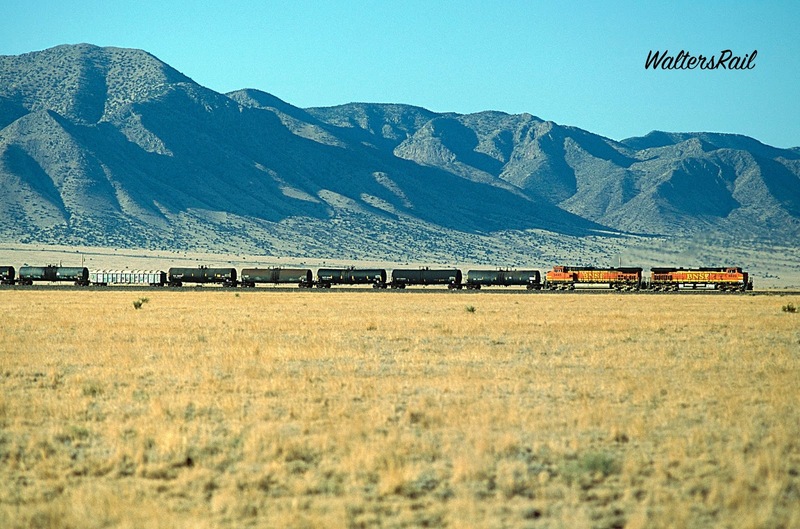 Is there a better place in the world for a railfan? You probably have your own favorite spot, but I am quite happy here––at this particular moment in time, with trains everywhere and a rapidly setting sun. 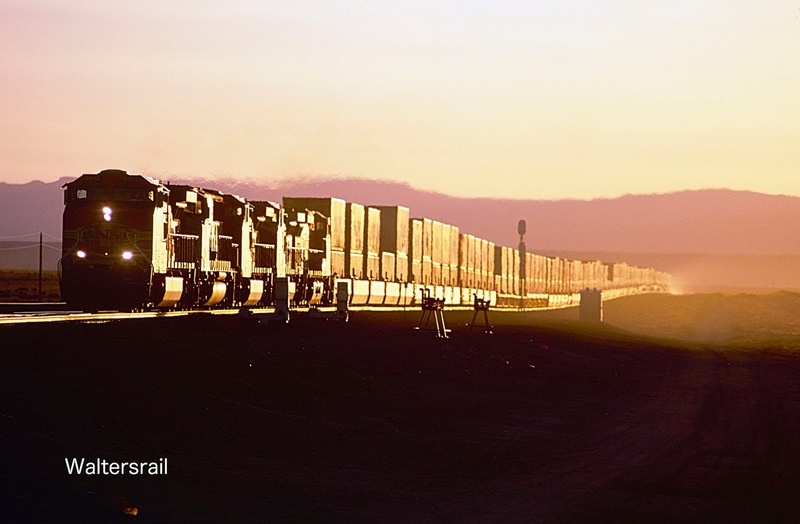 This image was taken close to June 21, 2009, the longest day of the year, very hot, with a fire raging on the mountain above the trains. The sun is setting about 30° north of due west, so now the photographer is standing north of the tracks, where in December he stood to the south. An occasional automobile still rushes past on the highway, since traffic patterns do not change with the seasons, but it is now hot enough to sweat, or would be if there were any humidity in the desert air. 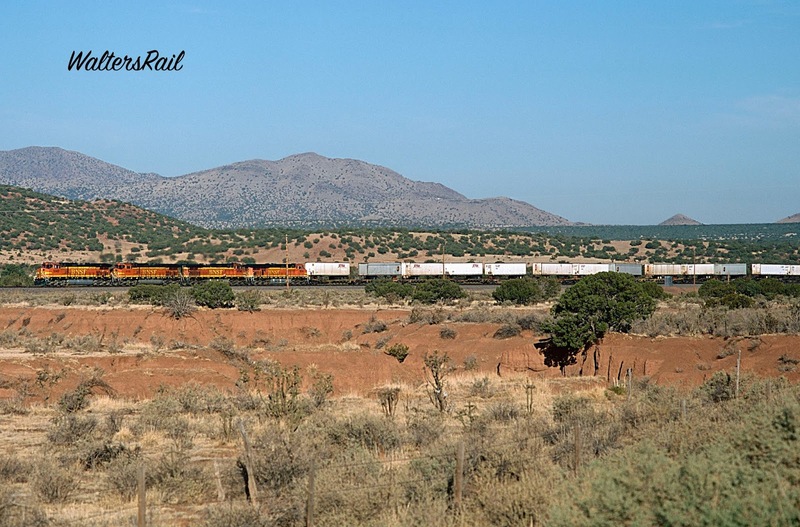 This post will travel from the Highway 47 grade crossing, following BNSF’s Transcon as it climbs the rugged grade out of the Rio Grande valley to the summit at Mountainair. The images will follow in geographical order from west to east, and occasional links to Google Maps will indicate good locations for photography. In case you are wondering, the fire was extinguished the next day, when I learned that it had been a controlled burn started by the U.S. forest service. 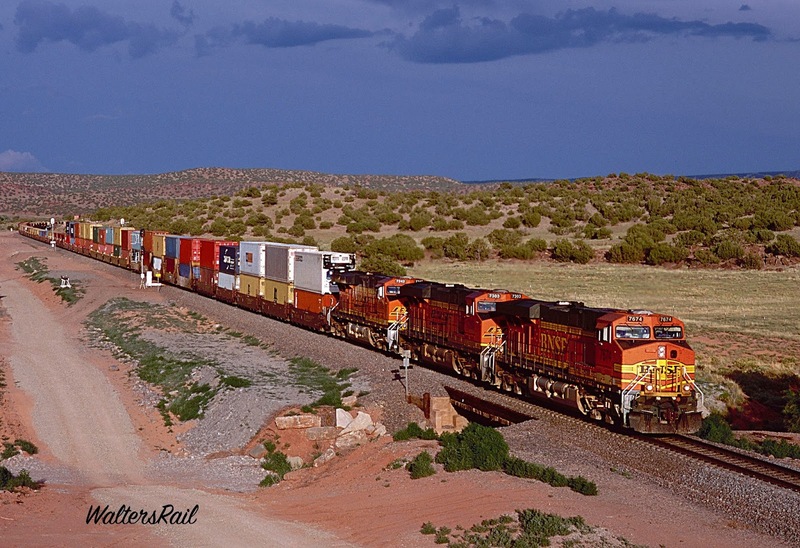 I have taken many images of the Transcon while standing at the Highway 47 grade crossing. What still amazes me after all these years is how traffic does not slow down approaching the tracks. 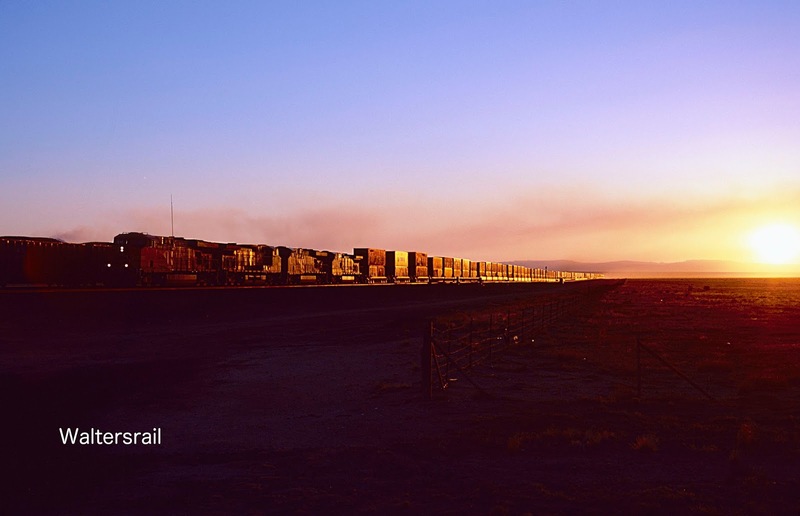 With the exception of Union Pacific's triple track mainline through Nebraska, the Transcon's crossing of Highway 47 is arguably the busiest main line in North America. 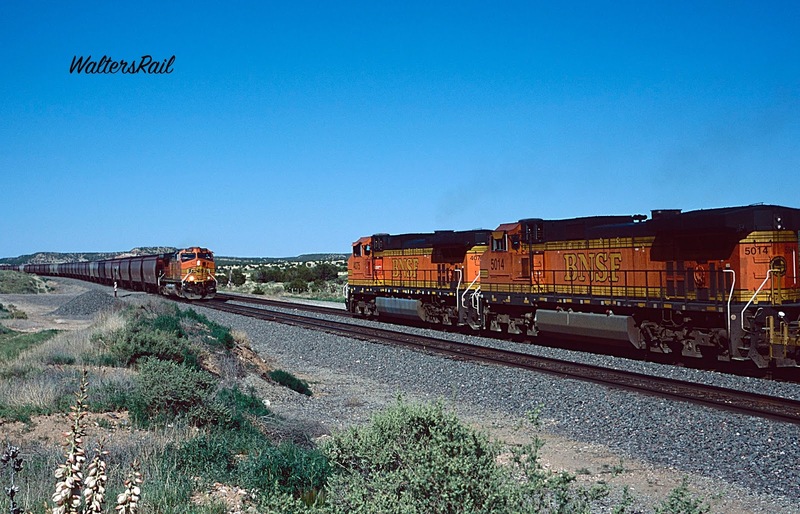 It is not uncommon for trains in opposite directions to meet at the crossing. Six or more trains per hour is nothing unusual. Nonetheless, vehicles race through here as though on their way to a hospital's emergency room– where I recently resided while skillful physicians repaired a hand that I injured while attempting to domesticate a holly tree. The following two images were taken within five minutes of each other late one June afternoon. The first photograph shows eastbound trailers preparing to cross the highway. The sun is setting behind low mountains to the west. In the second image, the photographer is looking east toward Abo Canyon, where the railroad navigates a crevice through the ancient granite and rhyolite. As the above images indicate, photography at the highway 47 grade crossing is controlled by the angle of the sun at different times of the year. 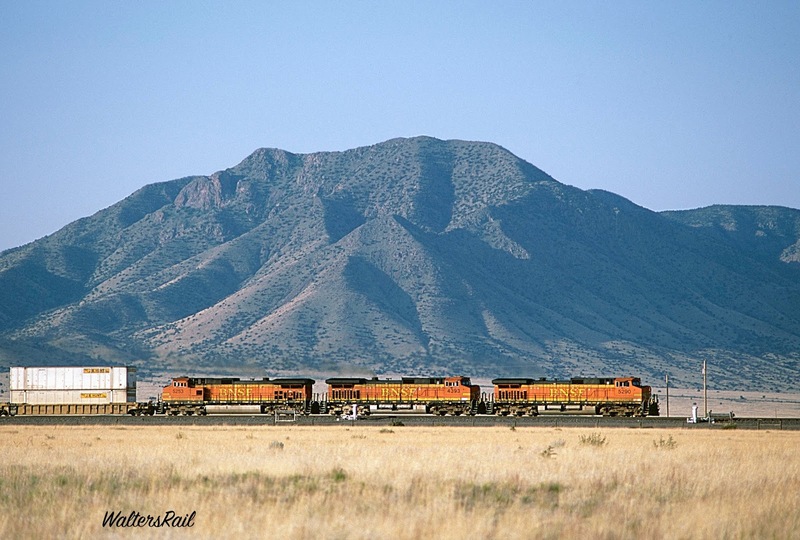 The following photographs were taken in early-morning of high summer, looking southwest across the BNSF Transcon toward the Los Pinos Mountains, with Whiteface Mountain being the tallest peak at 7350 feet. The core of these mountains is composed of quartzite, schist and rhyolite, all intruded by granite. According to sources I have read, the Pre-cambrian bedded rocks extend 12,000 feet in thickness, of which over 4500 feet are rhyolite flows. Rhyolite is a type of volcanic lava with high viscosity due to a high silica content. It thus flows slowly, like toothpaste squeezed from a tube, and tends to pile up and form lava domes–– huge globs of molten rock that solidify relatively close to the source of extrusion. Lava domes are very common in west central Arizona where the Transcon winds through the Crookton Cutoff. Granite is the cooled and exposed magma chamber for extruded rhyolite, thus indicating that the Los Pinos Mountains, like many of the ranges in New Mexico, were originally created by Pre-cambrian vulcanism. What we see today are the greatly eroded remains of ancient cataclysm, lending support to the theory that modern landmarks were mostly created by gigantic geological events that tax the imagination. As an aside, due to the injury recently suffered to my hand, I am dictating this post on a voice recognition program which consistently translates Los Pinos Mountains as El Bano Mountains. I have no idea why this happens, and I leave the rest to your imagination. The injury to my hand could be described as,"I fought the hedge trimmer, and the hedge trimmer won." In the winter, after the sun has moved far south in the sky, the photographer need merely cross the tracks and drive south on Highway 47 about half a mile. 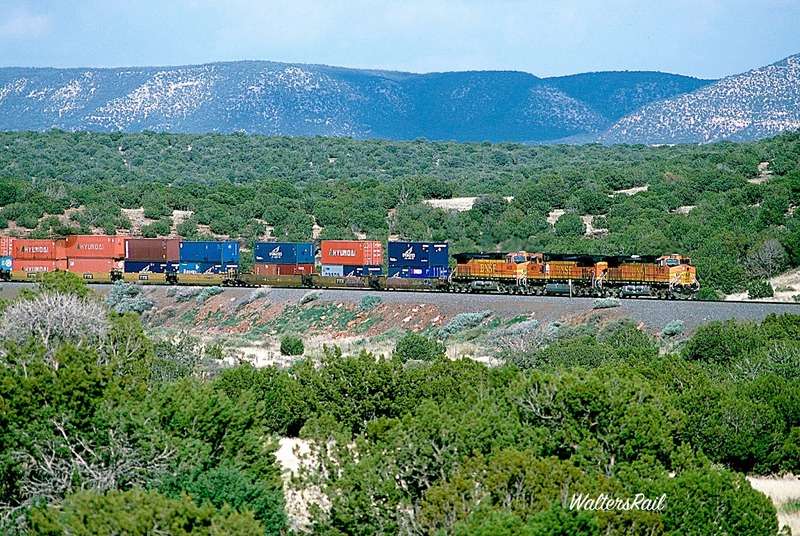 Then you can turn north and photograph trains both climbing and descending the long approach from the river valley to the Manzano Mountains. "Manzano" is Spanish for apple and refers to old orchards which legend claims were planted in the mountains by 17th century Spanish priests traveling to nearby Indian pueblos. Recent studies, however, based on analysis of tree rings, indicate that the trees were planted in the early 19th century. The remaining few are probably among the oldest in the United States. The Manzano Mountains are a fault block, part of the eastern flank of the Rio Grande rift that formed during the Miocene, approximately 15-20 million years ago. A fault block mountain is formed when geological forces pull the Earth's crust apart. Some parts are pushed upward, while others collapse down. Faults are simply cracks in the Earth's crust, commonly found where tectonic plates are rubbing against each other in opposite directions. Movement along a fault creates earthquakes. Over enormous periods of time, millions and millions of years, part of the crust is pushed up to form mountains. While the Earth is rising, wind and rain are conspiring to erode it back to its original level, creating the characteristic serrations that we view across western North America. This erosion also fills and levels the portion of the ground that has been sinking beside the uplift. The following images were taken late one December afternoon in 2008. 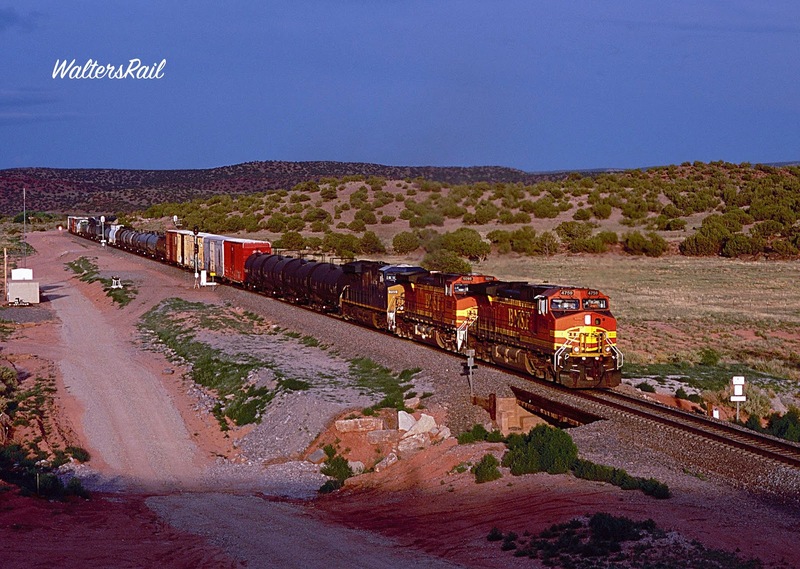 My friend Carl Graves and I had agreed to rendezvous in Los Lunas, New Mexico, for a few days of train photography, and I had awakened at 3:00 AM that morning in anticipation of the trip. Since I was unable to return to sleep, and since I had loaded my vehicle the previous evening, I decided to hit the road before dawn. The sun rose as I was crossing the Oklahoma border into the Texas Panhandle. By lunch, I had reached the Vaughn flyover, where the Transcon crosses the Union Pacific Golden State Route. 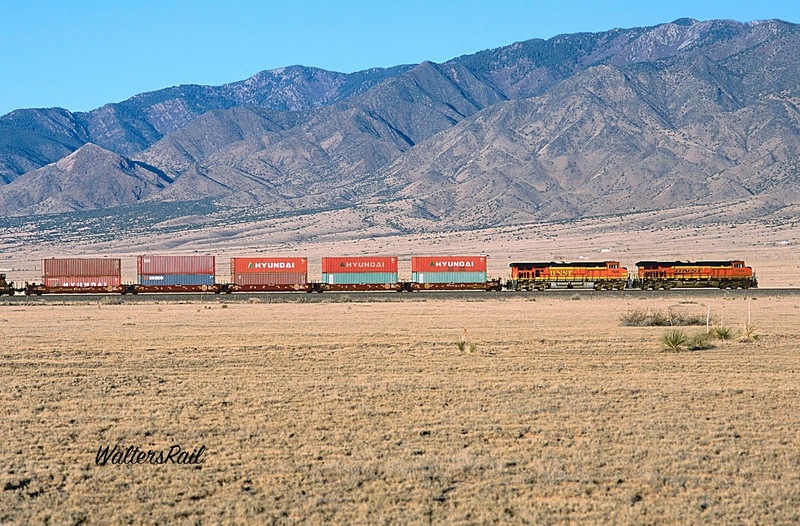 After taking some "meet shots" at Vaughan, I followed the BNSF west until I crossed the mountains and descended into the valley of the Rio Grande River. The sun was sinking to the southwest, casting beautiful light on the Manzano Mountains. I stopped my beside highway 47, set up my tripods and hoped to see a train or two before sundown. To my significant pleasure, seven trains rolled past in the next 45 minutes. Some of the images are presented below. 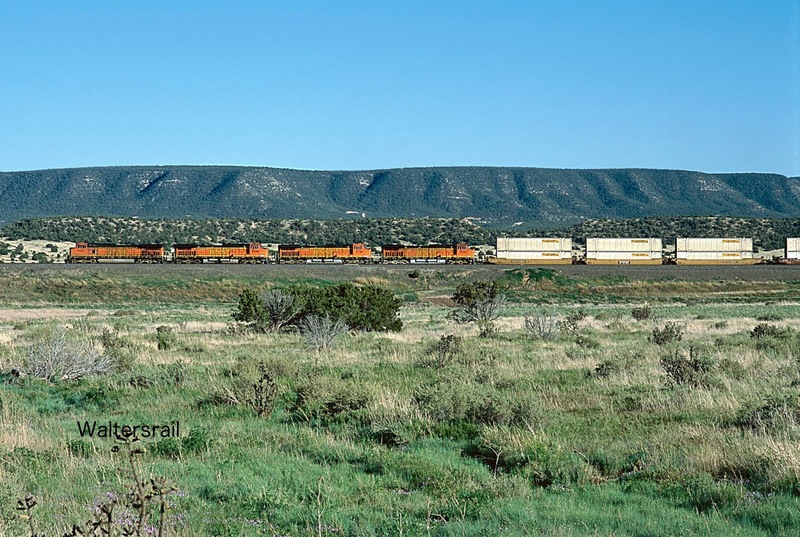 As trains climb the grade eastbound out of the valley of the Rio Grande, they turn south and enter Abo Canyon, a crevice in the transition zone between the Manzano and Los Penos Mountains. 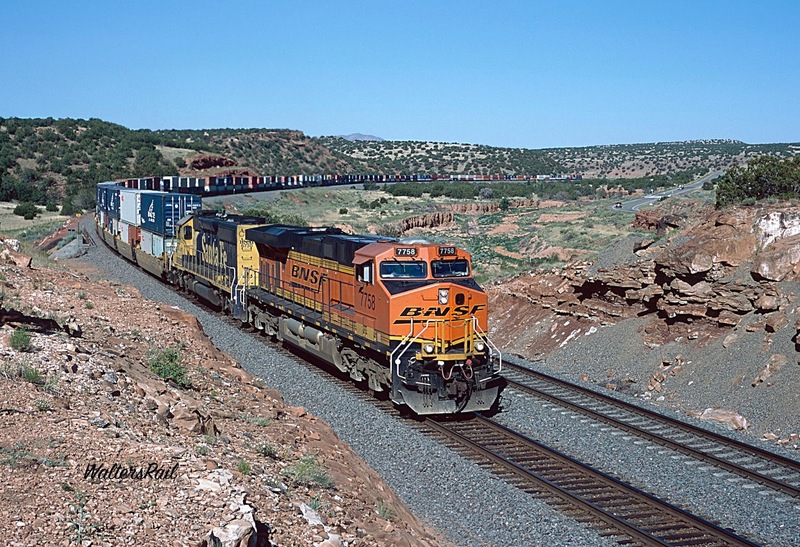 When the photographs in this post were taken, in 2007 through 2009, the line through the canyon was single track, creating a significant bottleneck for BNSF. A second line was opened in 2011, at a cost of approximately $85 million, which relieved the congestion on this portion of the Transcon. I have been unable to find any discussion on the origins of the canyon. To my eyes, it appears that a watercourse existed from the plains down to the Rio Grande long before any mountain-building began. As the Manzano Mountains began to rise, the pre-existing stream continued to erode the rock around it. Remember that in ancient times, as discussed above, the climate was far wetter than now. The stream managed to erode the rocks around it faster than the fault block could elevate them, creating the narrow passage, dry now most of the year, that we see today. 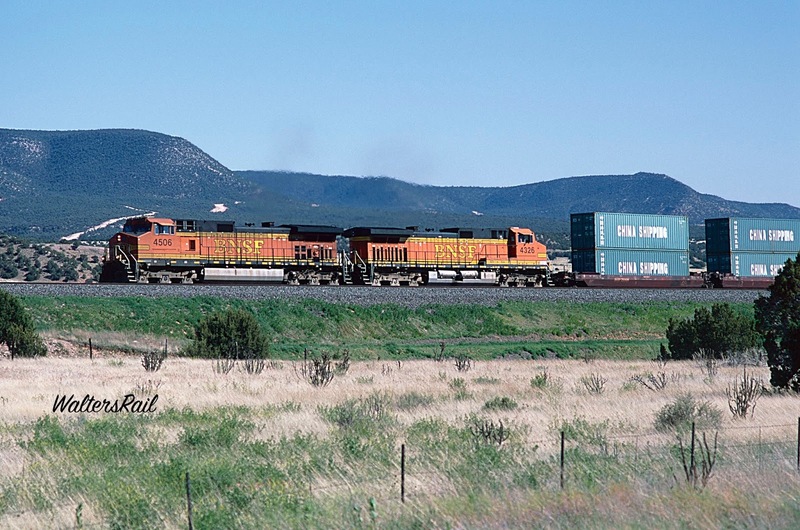 When Burlington Northern merged with the Santa Fe, access to Abo Canyon was restricted. In times past, one could either hike or drive into the canyon without drawing the ire of the Santa Fe. The last time I was in the canyon was 1995, before the merger, when the Santa Fe was running full lash-ups of pristine, red and silver Warbonnets. 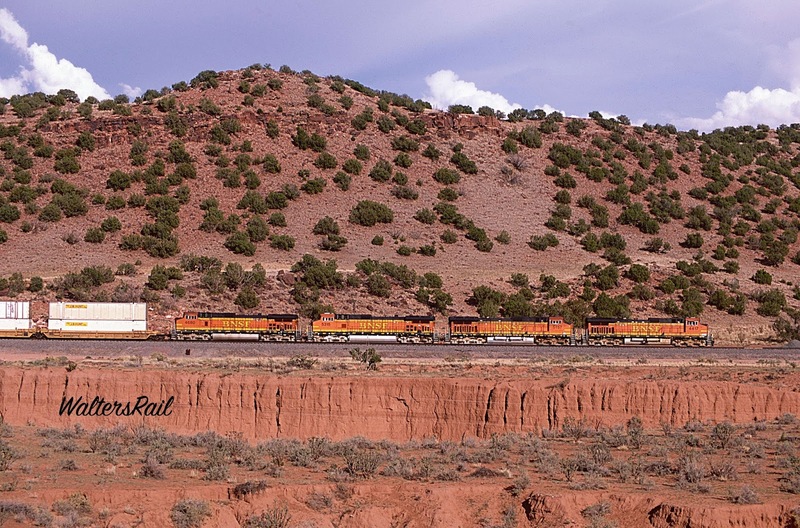 In the years following, whenever I approached the Canyon, I was always closely watched by either a BNSF employee or a private rent–a–cop. Because I did not trespass on railroad property, I was never accosted. The territory was guarded so closely, however, that I would never have been able to make it into the canyon. 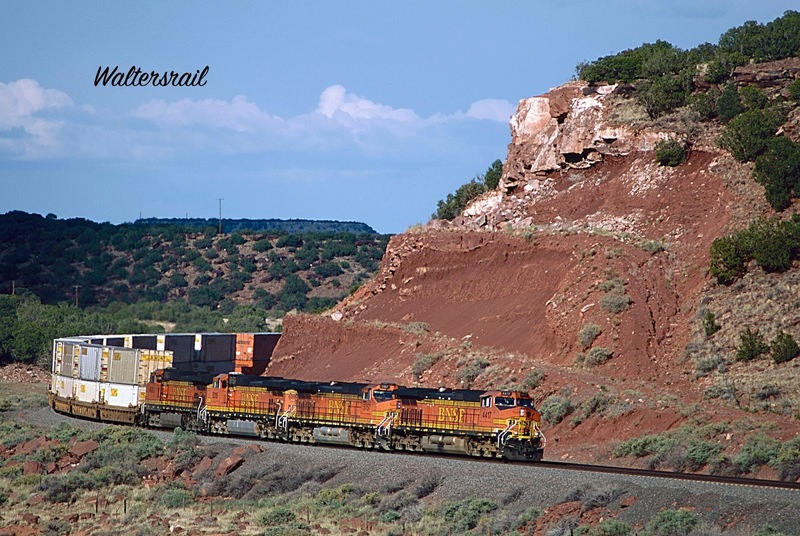 Otherwise, all I can show you here are images taken at the east end of the canyon, where U.S. Highway 60 crosses the tracks on an overpass–long a favorite railfan location. 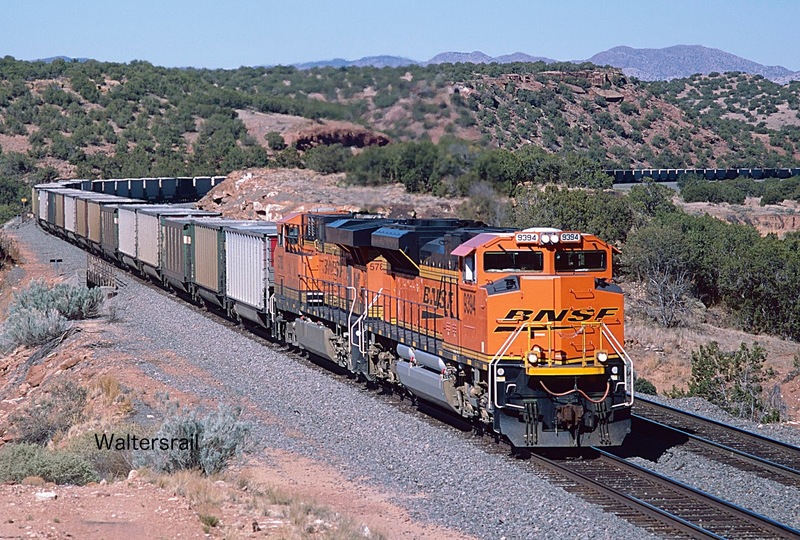 Here BNSF stacks are exiting the east end of Abo Canyon. The photographer is standing on the embankment beside U. S. Highway 60 and is positioned well north of the train to catch the early morning June sunlight. Today, this location looks entirely different, with a second main track to the left of the original, traversing a cut wide enough to lead a Tyrannosaurus through. If you stand on this embankment today, a BNSF employee will almost certainly come out to have a look at you. Since you are on public property, he will keep his distance. Don't be tempted to hike into the canyon. Westbound stacks are approaching the east end of Abo Canyon. The photographer is standing on the same embankment as in the image immediately above, though a different year, and has simply turned to look in the opposite direction. A late afternoon thunderstorm is pouring down rain on the High Plains east of Willard, New Mexico, and the sun has momentarily peeked through a break in the clouds. Before the widening of the canyon, this location (Scholle) was where the double-track mainline to Mountainair narrowed to a single track as it entered Abo. The image immediately below was taken about five minutes after this image and about five seconds before the sunlight disappeared. 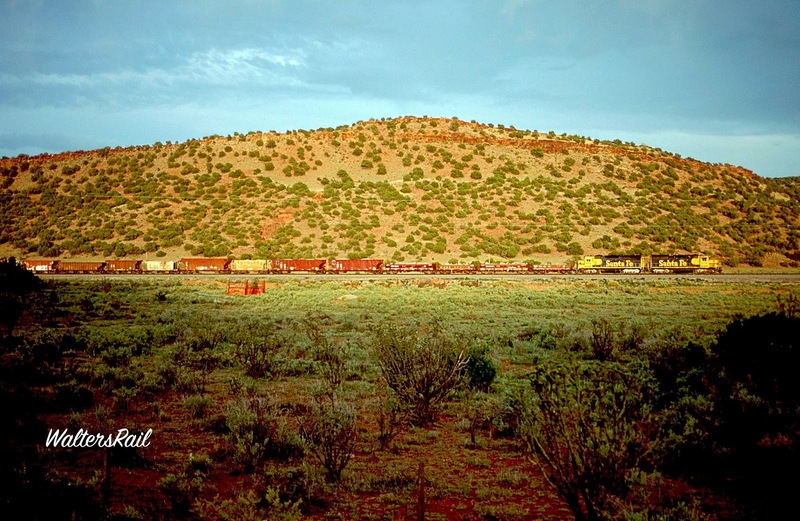 From this point, the tracks turn southeast for about one mile, climbing through low brown hills covered with Mountain Cedars, cacti and high desert grasses. The soil is bright red, reminiscent of Curtis Hill in northwestern Oklahoma. U.S. Highway 60 follows the tracks closely, with occasional turnouts to dwellings sheltering individuals who have rejected civilization. Dogs will howl if you approach too closely, and "no trespassing" signs are as ubiquitous as rocks. Someone would probably shoot me if I climbed a fence. More than once, I have walked near enough to arouse the ire of rattlesnakes. I almost stepped on one lounging in the sunlight. He chose not to bite. I nodded as I moved slowly away. We are traveling on what the New Mexico Department of Tourism calls the "Abo Pass Trail," described as "a unique highway route which showcases the natural beauty and historic significance of New Mexico. 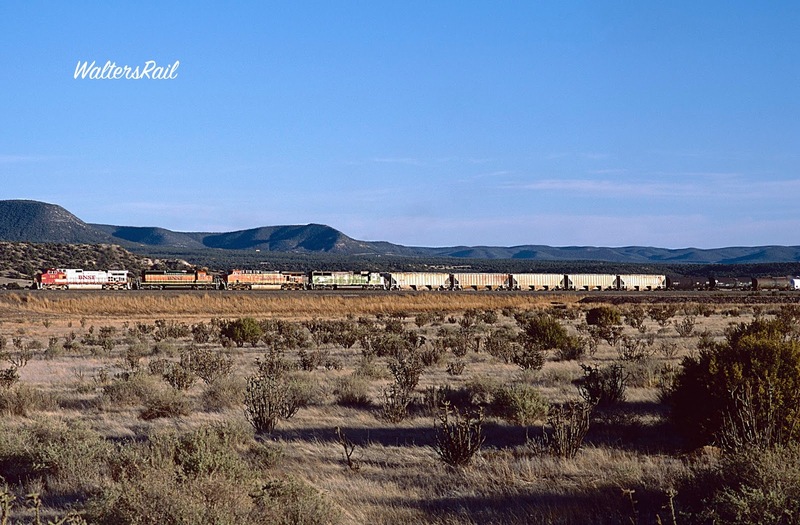 The route is located within Socorro, Torrance and Valencia Counties and connects the Salt Missions Trail and El Camino Real scenic byways. This was an important segment of a Native American trade route first established in 1450 AD. The route eventually became part of a trade corridor which linked the Pueblos and the Plains Indians to El Camino Real and a network of trails throughout the Southwest. The byway offers one of the few remaining pristine and panoramic views of the Manzano Mountains, as well as unspoiled open spaces and a national wildlife refuge. Those traveling the byway can also see traditional rural lifestyles that have been maintained in small communities." No mention of the railroad, which I suppose is not surprising. I do get a chuckle every time I read about"traditional rural lifestyles." This location is where the tracks turn northeast, and the grade stiffens. Notice the red soil (the Abo Arroyo) and the abundance of cacti. Mountain Cedars are the only trees in sight, none taller than about 15 feet. This image was taken from the highway. About a mile north of the image immediately above, a short local is heading westbound to Belen. It was rare in 2009 to see Santa Fe power in its original paint scheme, but here you go. This image was taken on a totally overcast day in which, to my amazement, the sun appeared for about 15 seconds as this train was passing. I slammed on the brakes, jumped out of my vehicle and took the shot without benefit of aperture setting or tripod. That it turned out is a testament to blind luck. Below is an image from roughly the same location, taken on a sunny day, though at a different angle that shows the Abo Arroyo. 6. The Glorieta Sandstone, consisting of crossbedded, laminar and ripple quartzes sandstone. "Bursum deposition took place in a mixture of non-marine fluvial and shallow marine environments in a tectonically active, mostly coastal setting. Rivers that deposited the Abo Formation formed extensive muddy floodplains traversed by incised rivers early in Abo deposition that gave way to extensive sheet flooding later. Yeso sedimentation began with dominantly eolian deposition on an arid coastal plain (Arroyo de Alamillo Formation) followed by deposits of coastal sabkhas, dunes and restricted marine embayments (Torres and Cañas Members of Los Vallos Formation). Yeso sedimentation ended with the Joyita Member of the Los Vallos Formation, which formed by eolian and fluvial processes during lowered sea level. The Glorietta Sandstone is mostly of eolian origin." The quotation and a far more detailed discussion can be found at New Mexico Geological Society Guidebook, 67th Field Conference, Geology of the Belen Area, 2016, p. 313 – 350. This can be found online at: https://www.researchgate.net/publication/308019921. So what we have are rivers and a shallow coastline creating sand during a period (tectonically active) of earthquakes and volcanoes. Later the area was covered by massive rivers which generated equally massive flooding. Later still, the climate turned arid, forming sand dunes. If you wonder how the climate could change so drastically, remember that the landmass we now call North America was migrating from a tropical to a temperate climate with the movement of the earth's tectonic plates. So over millions of years, an incredibly complex landscape was created that we see today as we travel from Highway 47 to Mountainair. 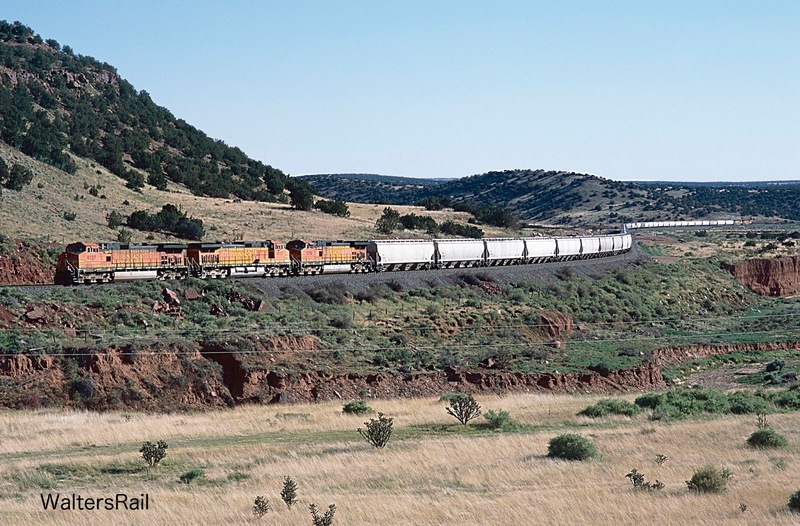 This is an image of the same location, taken from a different angle, showing a loaded commodity train climbing the grade beside a dry Abo Arroyo. Here the tracks are turning due east. The photographer is standing on the side of U.S. Highway 60, looking down the valley toward Abo Canyon. Immediately to the left of the train is the beginning of a large cut showing many of the geological layers discussed above. This link shows the location on Google Maps: https://goo.gl/maps/6jEvZHWUmE52. The image immediately below shows a train coming downgrade beside the cut. The second image below shows a Z Train coming upgrade in the same location. The different geological epochs exposed in the cut are striking. Perhaps most striking of all is the bright sandstone at the top of the cut. During the Permian epoch, New Mexico was covered by a sea which over the eons grew and shrank with the climate before finally disappearing altogether. As the sea spread back toward northern New Mexico, away from the Permian Basin of West Texas, its waves washed the sands of the coastal plain, creating bright yellow beaches. As the climate grew dryer, then dryer still, this sand blew into pale dune fields that over millions of years cemented into what today is called Glorietta Sandstone. This formation is prominent at the top of the cut in the two images below. Those two images also show the Abo Formation beneath the Glorietta Sandstone. The Abo Formation was created when the area we now call New Mexico was situated near the equator and rainfall was monsoonal. Sand and other fine-grained material were spread across alluvial plains, cut and re-cut by rivers and smaller streams, both steaming and baking under the equatorial sun. The land filled with a dark red blanket of mud, silt and sand. These sediments have been given the name Abo Formation because their outcroppings are so prominent at Abo Pass. 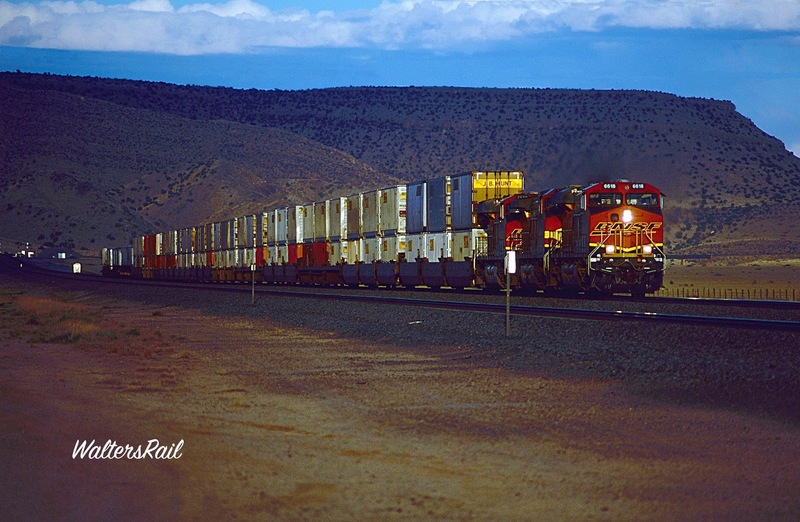 In this photograph, westbound stacks are rolling downgrade towards the big cut. U.S. Highway 60 runs through a defile between the elevated tracks and the embankment on which the photographer is standing. It took some effort to reach this location. I was breathing heavily, trying to set up my tripod, as one more in the long line of BNSF westbound intermodals came down the hill. 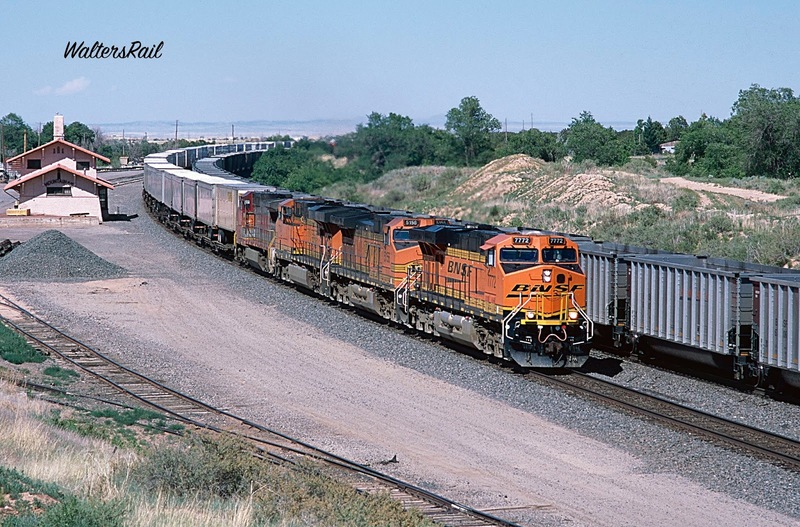 In those days, before construction of the second track through the canyon, BNSF would fleet trains in both directions. Four or more eastbounds would come up from the river valley, then four or more westbounds would race down the hill. This train was fourth in a line of seven, and I snapped the shot just-in-time. "The State is already at work logging the Abo highway on it’s [sic] western extremity. This highway can pass through La Lande [De Baca County, New Mexico] though there is a possibility of its passing a mile south of us. 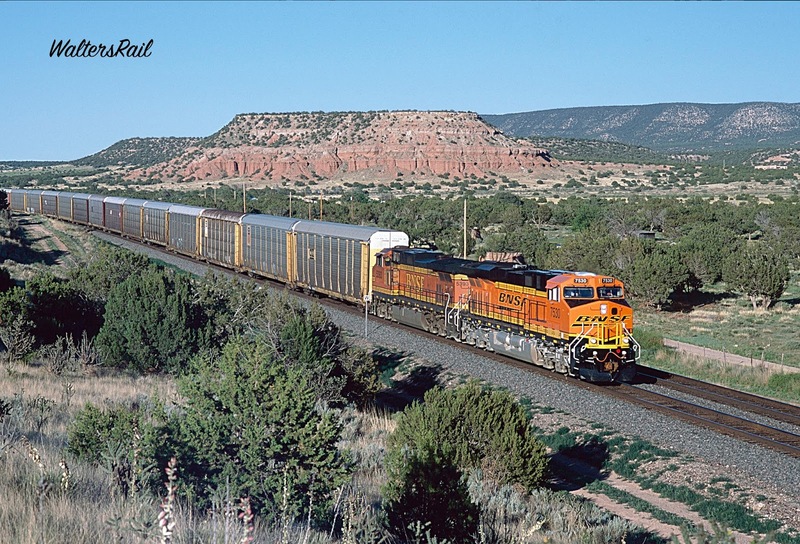 The counties of Guadalupe and Roosevelt are planning to help on the construction of the road from Fort Sumner to La Lande on the section line running through town if La Lande will secure the opening of the road east of this place. One plan is to go east from the town as far as the section line near Mr. Isaac Sandoval’s ranch house then turn south to the railroad track and follow the track eastward on the north side to Taiban. "This is certainly a very important matter to the business of La Lande and to every one whose land may be touched by this highway as it will be a state road and will always be kept in best repair." By the mid-1920s, the highway had expanded east into Oklahoma, where it promised a link to civilization. According to legend, one promoter of the highway in Oklahoma said, "All it takes to make a Christian out of a county commissioner is to take him on a trip through the east, where all the main roads are hard-surfaced, then bring him back to the dirt roads of Oklahoma." I can testify from personal experience that there are still quite a few dirt roads in my home state. 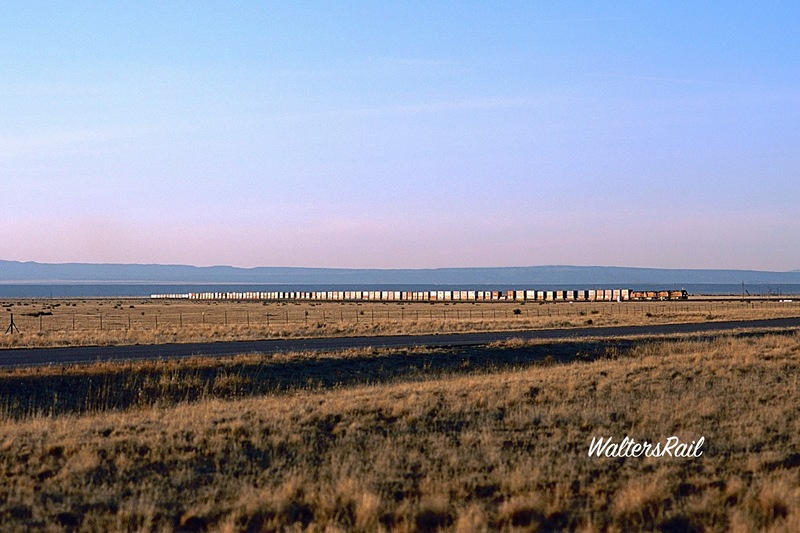 More BNSF Stacks are climbing the pass about 2 miles west of the previous photograph. (The voice recognition program translated "more BNSF stacks" as "Laura BNSF Starbucks.") To the right of the train (north) are the Abo Arroyo and Highway 60. The cut shows one of the many sandstone and siltstone layers that comprise this world. I am not enough of an amateur geologist to identify which. 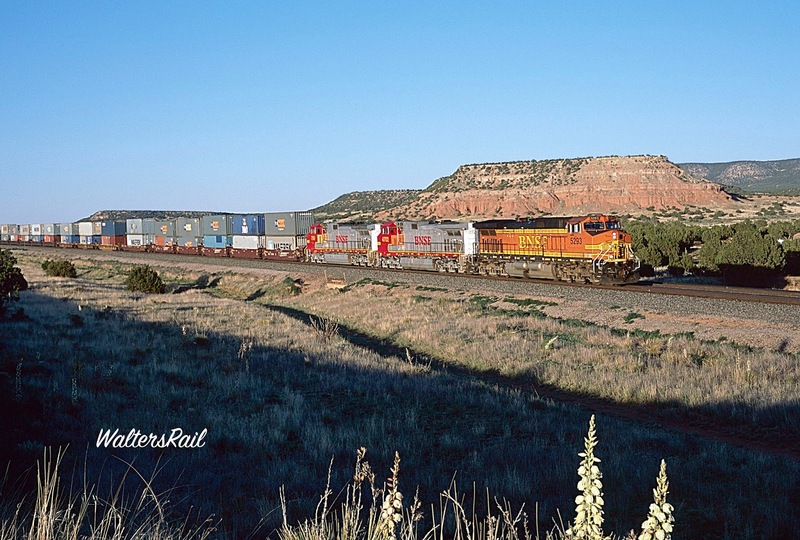 I have included this image, in part, because like one of the photographs preceding, it contains Santa Fe power in its original paint scheme -- an SD 40-2, originally ATSF 5071. 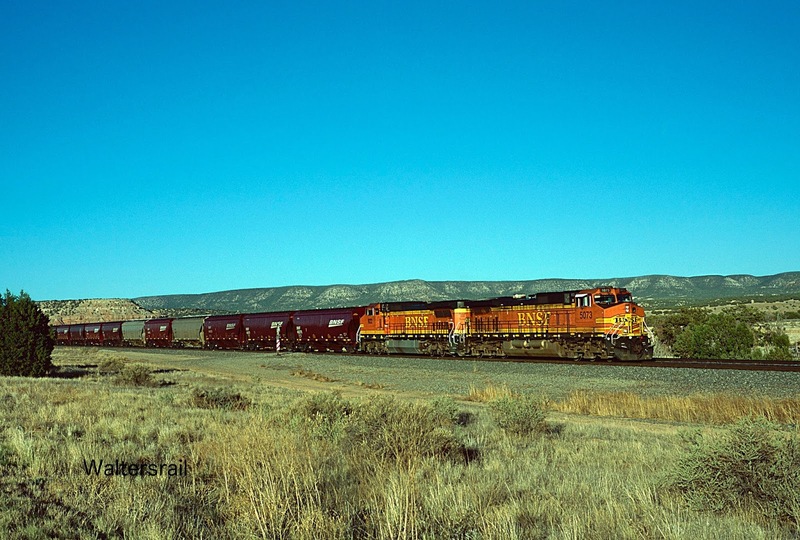 An SD 70ACe leads a taconite train at the same location, which can be reached by parking your vehicle along County Road B002, then hiking about a half mile to the west until you reach a moderately deep cut. South of the tracks sits a small, clapboard dwelling with a fenced yard that backs almost to the edge of the cut. If you are waiting for a train, you will feel that you are trespassing, but you will not be. I have been to this location several times, and the property owners have not complained or otherwise said a word to me. Perhaps this is because I am old and harmless. 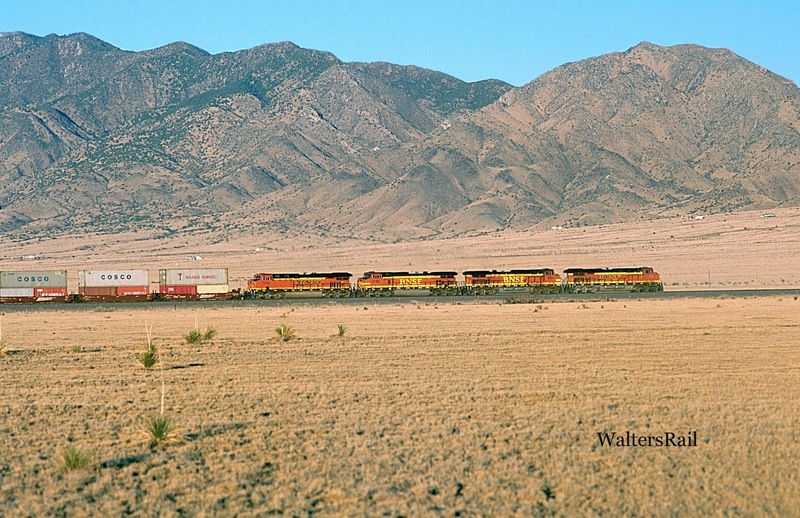 Two trains are meeting at the County Road B002 grade crossing, with yucca blossoms in the foreground. There is a wide area here to park one's vehicle. The westbound grain train had only a single unit on the point, but three were pushing, the only time I've seen such a lashup. A couple of miles northeast of this point, we reach a location where the railroad originally constructed a station called "Abo." This area is called the Salinas Valley and was occupied as early as the 10th century, first by Mogollon then Anasazi cultures, who established trade routes serving the Rio Grande Valley and the High Plains. These peoples were forced to abandon the area during a particularly dry period. Later, Spanish Franciscans built missions at each of the three abandoned Salinas pueblos. One of those, Abo, has extensive unexcavated ruins built about 1300 A.D. and red sandstone ruins of the monastery of San Gregorio de Abó built in the early 17th century. In 1912, the AT&SF arrived and established the settlement next to the ruins as a station stop and small town. At one time, Abo, New Mexico, supported a school, two saloons, a post office and a Catholic church. Like many railroad towns, Abo did not survive. The Santa Fe closed the depot in 1940, and the school followed in 1960. Today, only the ruins of the original pueblo and a few other buildings remain. Following are images of three westbound trains at Abo. Past Abo, the highway and railroad run side-by-side for about two miles. The tracks then curve harder to the east, while the highway turns more northerly. In late afternoon of high summer, the sun will illuminate both eastbounds climbing the final grade to Mountainair and westbounds engaging dynamic brakes as they head down the pass toward the Rio Grande. 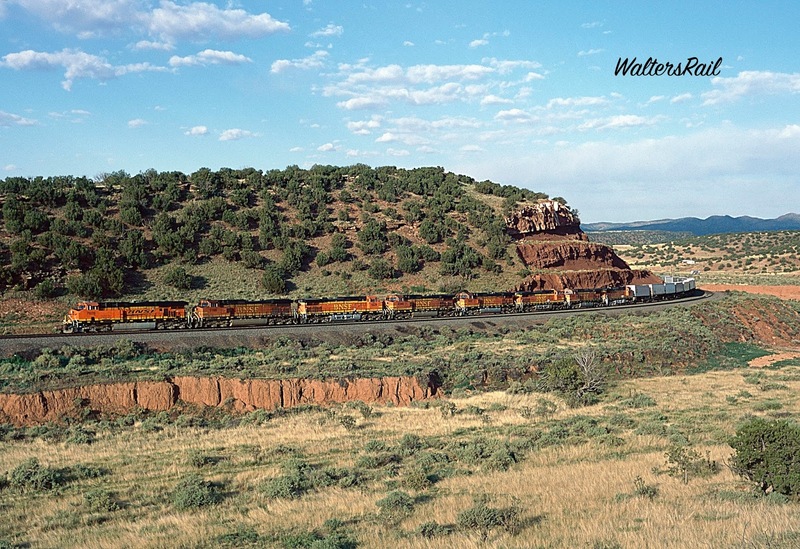 In the background is the long flat top of Chupadera Mesa, forming a striking backdrop for the BNSF. And so we arrive in Mountainair, founded in the summer of 1903 by John Corbett, Colonel E.C. Manning, and former U.S. Governor E. S. Stover in anticipation of the railroad. 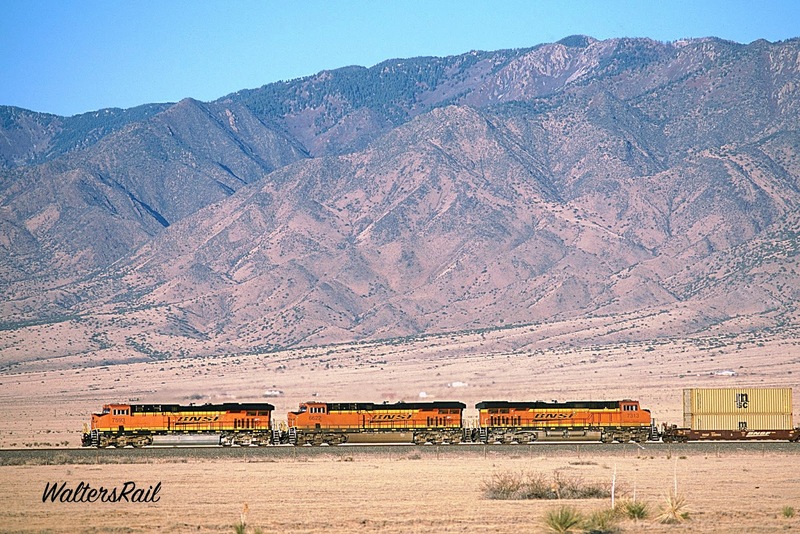 Mountainair was the first incorporated town in the area–before Torrance was a county and before New Mexico became a state. Sitting at the summit of Abo Pass, the small community overlooked both the Manzano Mountains and the Chupadera Mesa. Local residents claim that cool winds blow down off the mountains in the summer; however, whenever I am there in June or July, the weather is hot and dry, and the winds are filled with sand. Perhaps this is why the town's population has steadily dwindled from about 5000 in the early 20th century to about 900 in the 2010 census. In the mid-1990s, two business partners refurbished the old hotel near the railroad tracks. I ate there more than once and spent a couple of hours on a mind-numbing conference call that vacation would not allow me to avoid. The surroundings were comfortable, almost elegant in an understated way, and the owners were friendly and optimistic about their business and its prospects. Thereafter, every time I drove through Mountainair, I stopped by the hotel to see if it were prospering. Into the early 21st-century, the doors were still open and the restaurant was still serving delicious food. As time went by, however, I noticed that paint was beginning to peel around the windows, and there were fewer and fewer automobiles in the parking lot. I am not optimistic by nature and wondered how such an operation could stay in business in a town in which most of the streets are dusty trails leading to dead ends. My fears were confirmed on a recent trip to Mountainair. The hotel was closed. The old AT&SF depot still stands and is on the National Register of Historic Places. 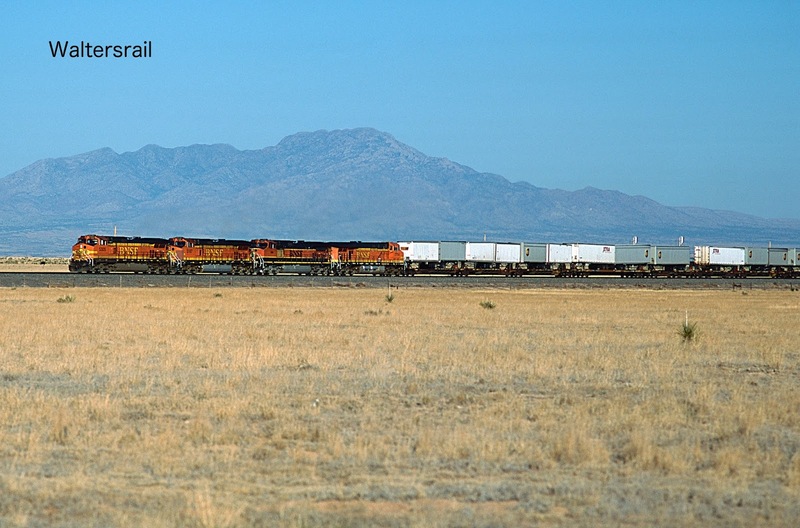 The image below shows westbound trailers passing an empty coal train beside the depot. In the distance are the High Plains of eastern New Mexico. At sundown, the red sandstone of Chupadera Mesa glows as though it has been heated, while the sky begins to darken as though cooling down. Because traffic through Mountainer is almost non-existent, one can park anywhere in town and listen for trains grinding upgrade and whining downgrade. 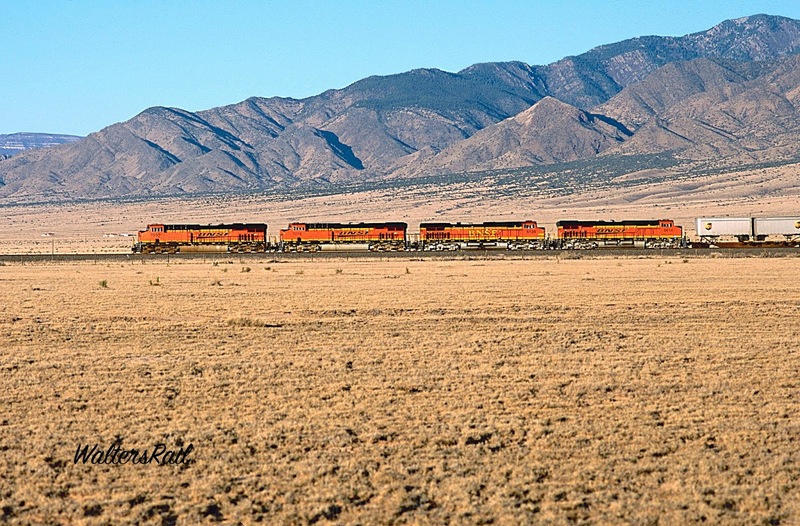 It is then possible to imagine generations of people moving through Abo Pass–Native Americans, Franciscans, railroad workers, railroad passengers, highway workers, highway passengers, early European settlers, all struggling to survive in this arid climate. Though the land is inhospitable, its beauty is unsurpassed. Thus, many are called, but few are chosen. In the early 21st-century, this land is as wide open and as untamed as it has ever been. To see my other posts, go to https://www.waltersrail.com/.